Rinse any ice glaze from frozen Alaska Cod fillets under cold water; pat dry with paper towel. Heat a heavy nonstick skillet over medium-high heat. Brush both sides of cod with 1 tablespoon oil. Place cod in heated skillet and cook, uncovered, about 3 to 4 minutes, until browned. Shake pan occasionally to keep fish from sticking. Turn cod over, cover pan tightly and reduce heat to medium. 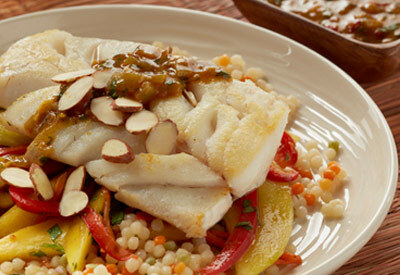 Cook an additional 6 to 8 minutes for frozen cod or 3 to 4 minutes for fresh/thawed fish. Cook just until fish is opaque throughout. Remove fillets from pan; keep warm. In the same pan, saute shallots in 1 tablespoon oil just until soft, about 2 minutes. Add cilantro, ginger, 1 cup vegetable broth, sugar, garlic, saffron, cinnamon and allspice; cook until thickened. Meanwhile, prepare couscous according to package directions, using remaining vegetable broth as part of the liquid. In large bowl, combine mango, bell pepper, carrot and cilantro. In separate small bowl, blend lime juice and peel, orange juice, honey and cinnamon. Pour dressing over slaw; toss. For each serving: Place about 3/4 cup couscous on a plate; top with 1/2 cup mango slaw. Top with a cod fillet. Pour 1/4 cup shallot sauce over fish; garnish with 1 tablespoon toasted almonds.